As the song says, “We all need somebody to lean on”. We also need to be the “somebody” to lean on. But, sometimes you don’t have what your friend may need most. This tale teaches that by using some creative problem solving, you may be able to do more for others than you initially think. 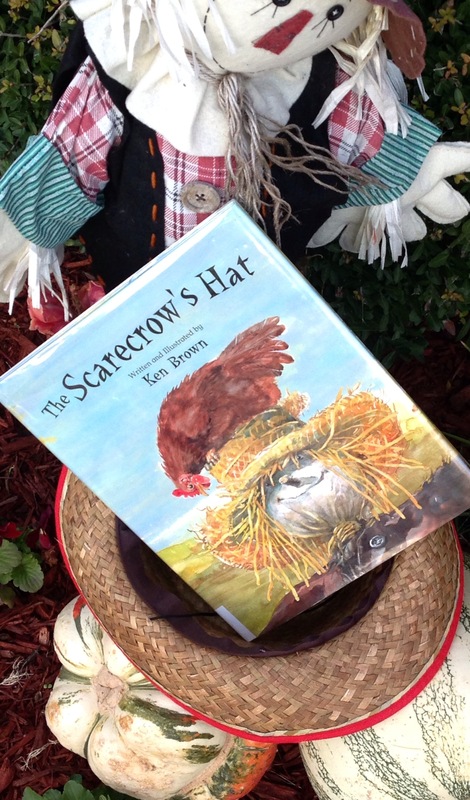 “That’s a nice hat,” said Chicken to Scarecrow. “Yes, it is,” replied Scarecrow. But I’d rather have a walking stick. I’ve been standing here for years now, and my arms are so tired. 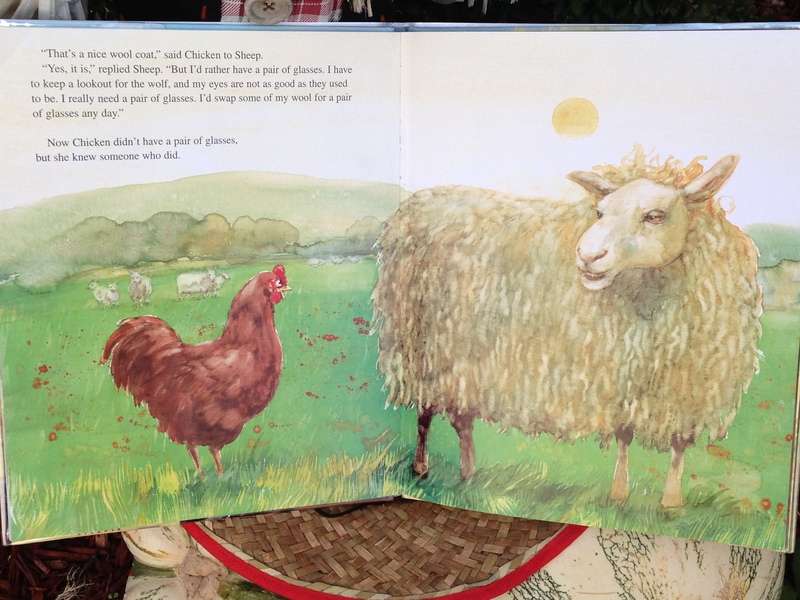 Now Chicken didn’t have a walking stick, but she knew someone who did. So, chicken begun her journey to help solve her friend’s problem. Her first stop: Badger. Now Badger did have a walking stick, but he was using it to prop open his front door. However, he wanted a ribbon to tie the door open instead so he wouldn’t trip over the stick. So, all chicken had to do now was find a ribbon and make a trade . . .
Next stop: Crow. Now Crow did have a ribbon, but she wanted wool instead to line her nest. So, Chicken knew where to go. Next visit: Sheep. Now sheep definitely had wool, and she was ready to trade some for a pair of glasses. She needed to keep a lookout for the wolf and her eye sight wasn’t as good in her older age. So off Chicken headed to Owl’s place. 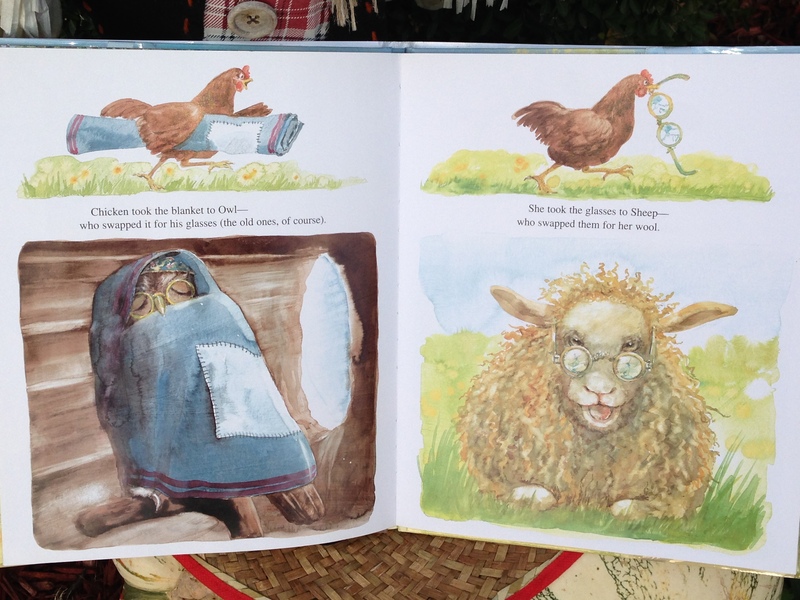 Now Owl readily had a couple of pairs of glasses, but what he really needed was a blanket to cover his window so he could sleep during the day. That left Chicken with one final stop: Donkey. Donkey had the perfect blanket covering his back, but he really needed some feathers to swat away the flies irritating him. Now feathers was something Chicken did have! of her longest feathers and tied them to Donkey’s tail. 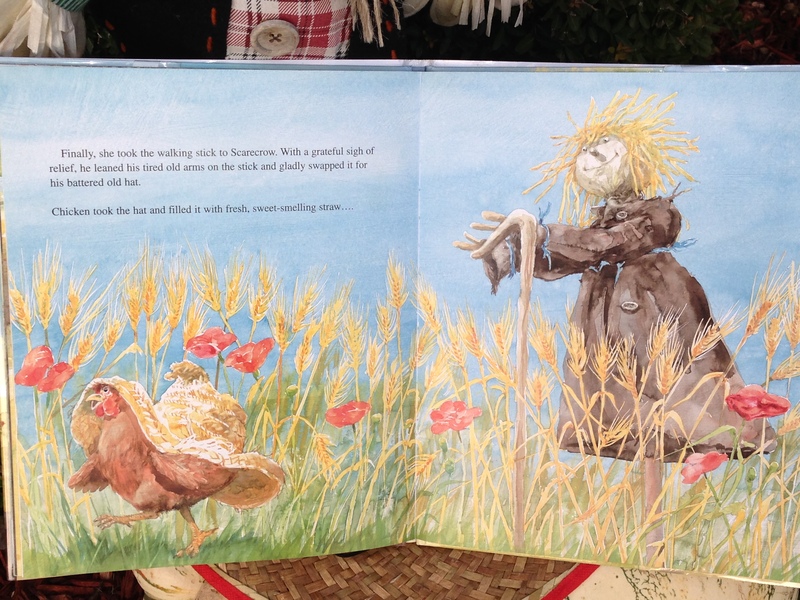 and finally, Chicken gave the walking stick to her friend, Scarecrow. . . .
who gave Chicken his hat. His problem was solved as now he had a walking stick to lean on, all because a friend helped him. And Chicken, well, she couldn’t be happier to make a cozy nest in her hat. “That’s a nice nest,” said Duck. 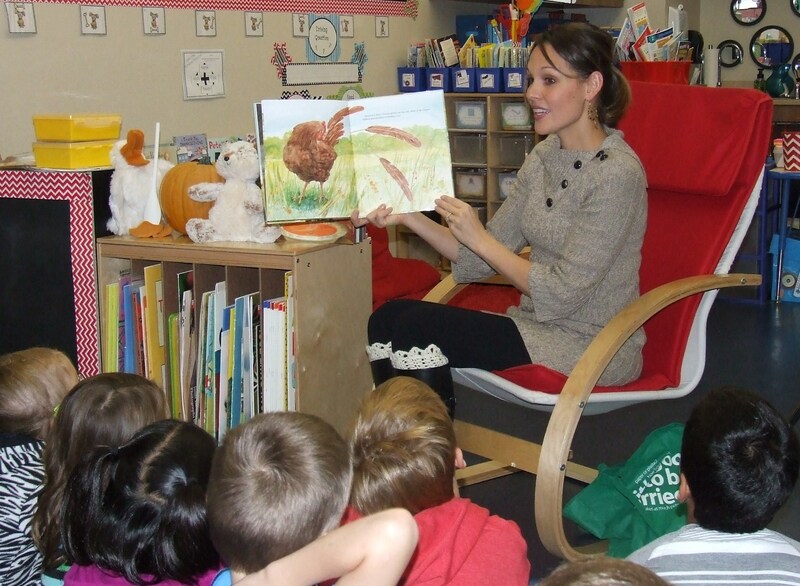 When I introduced this story to my daughter’s class this week, I had them interact with the second half of the story by asking them to recall what animal would receive the item for a trade before I revealed the answer by turning the page. For example, I’d say, “Chicken has the blanket. Whoo is she going to take it too? (The “whoo” hint helped!) . . . and so on. They really had to recall the first half of the story in order to unfold the second half. Great problem solving skills! Good activity for a circular story like this one. Select a couple of questions or activities to do with your children or class. F- How does it make you feel when you help a friend? R- Can you relate to Scarecrow when he needed help from a friend? When did a friend help you? I- Imagine what it’s like to be a scarecrow. Write a letter to the farmer from the Scarecrow. Select a season and put a correlating date on the letter (June/summer). Then tell the farmer what he sees everyday in that season. Tell the farmer what he likes and dislikes about his job. 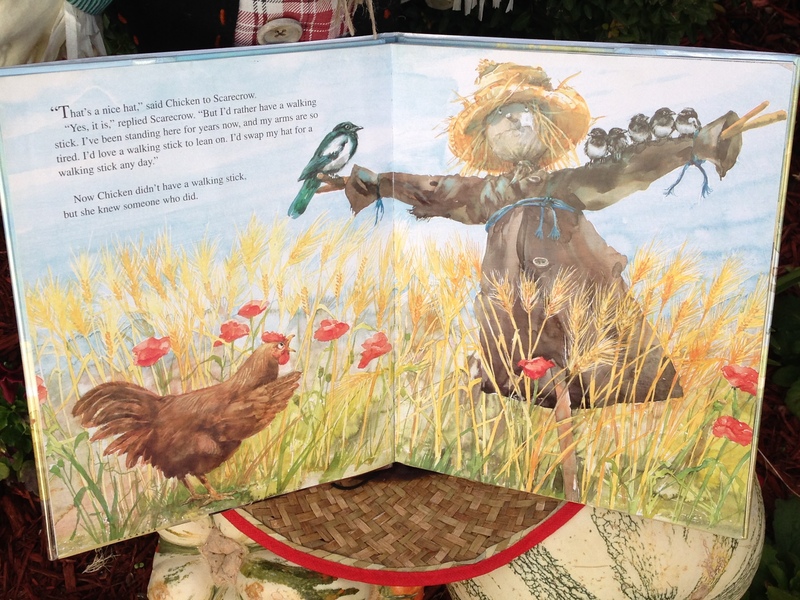 E- Explore different solutions that Chicken could do to get the Scarecrow a walking stick. N- Navigate your way back through the story after reading it through once by making a timeline of events that shows what item each animal needed and how they got it. S- Share with others this Thanksgiving by donating items, money and/or time to people who are in need. Opportunities are ample. YOU may be the somebody they need to lean on, even if it’s just for a little while. This entry was posted in fall, Friendship, problem solving and tagged children's books for fall, children's books for problem solving, children's books with badgers, children's books with chickens, children's books with crows, children's books with donkeys, children's books with owls, children's books with scarecrows, children's books with sheep, farming, harvest, Ken Brown, Peachtree Publishers, The Scarecrow's Hat. Bookmark the permalink.